Asus Zenfone 2 will hit the Philippine shores on May 16. We have listed 3 talking points purported buyers would want on its highly-anticipated release. Asus Zenfone 2 was released in the Southeast Asian region last month in Indonesia and it will hit the Philippine shores on May 16. Two versions have been announced for the country - the ZE551ML and ZE500CL. Both only have 2GB of RAM with the latter having 5-inch IPS HD display. Thus, this has sparked debates on whether the Taiwanese outfit will release the sought-after ZE551ML version with 2.3GHz CPU and 4GB of RAM in the country. We have listed down three talking points that purported buyers would want in the device’s Philippine launch. The statement has been reverberating all over the archipelago - most of us wanted to have the beefy RAM inside our Asus Zenfone 2. For one, most of us will agree that the RAM is the device's marquee feature. Asus releasing only 2GB RAM variants could drive away potential market share to other alternatives like Meizu m1 note and the recently released Alcatel OneTouch Flash Plus. Though we know that the handset will pack an Intel Atom mobile processor, we still want to have speedy processor cores in our Zenfone 2. Basically, the Zenfone 2's CPU speed ranges from 1.5-gigahertz dual-core all the way to 2.3-gigahertz quad-core. We need performance in our daily drivers; and releasing the variants in the upper end of the spectrum would definitely cater to this demand. Of course, we wouldn't want to get empty handed upon the Asus Zenfone 2 Philippine release. There should be enough units for everyone who are willing to spend their hard-earned cash, especially to those who have been holding the money only for the Zenfone 2. If you have another argument about the launch, there's a stream for comments section below. Please hit us. 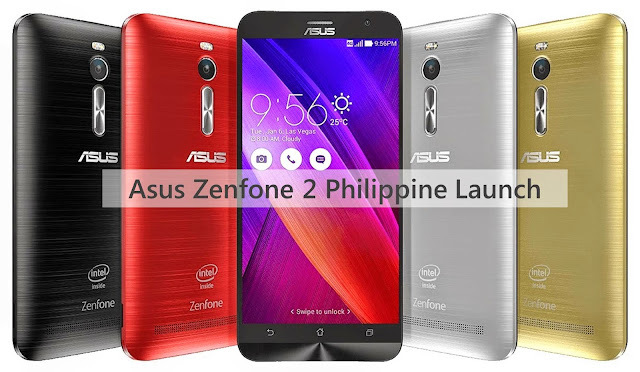 In the meantime, check out the specs of the confirmed Asus Zenfone 2 Philippine variants right after the fold.